England wicketkeeper Matt Prior says players will become increasingly "frustrated" unless the England & Wales Cricket Board (ECB) softens its stance towards the Indian Premier League. The ECB only allows England-contracted players to play half of the IPL season because of a clash with Tests in May. As a result, they are less attractive to IPL franchises, with Prior going unsold in the last two player auctions. Prior says the scheduling of Tests may have to change to keep players happy. The Sussex right-hander told BBC Sport: "I'm employed by the ECB, so I do what the ECB says right now. "If that's when the Test matches are, then that's when the Test matches are. My priority is playing Test cricket for England and when I am needed to play Test cricket for England I will play. "The one thing, however, is that the IPL and these Twenty20 competitions are not going away. "People love them and the players enjoy playing in them, so there are going to be more and more people getting frustrated at the lack of opportunity to play in the IPL. So things may have to change in time." England is the only Test-playing nation staging matches during the sixth edition of the IPL, which runs from 3 April to 26 May. Players who are centrally contracted by the ECB have to be back in England by 5 May in order to prepare for the international season, which starts on 16 May with the first Test against New Zealand at Lord's. The policy has been a constant source of tension between the board and star batsman Kevin Pietersen, who made no secret last year of his desire to maximise his IPL earnings by playing a full season for Delhi Daredevils. Fellow batsman Ian Bell, who tried unsuccessfully to land an IPL contact in 2011 and 2012, has admitted the lucrative competition is "a big attraction". Prior and his England team-mate Ravi Bopara, whose base prices were $200,000 and $100,000 respectively, failed to attract any bids from IPL franchises in the auction on 3 February, leaving Pietersen and Eoin Morgan as the only England-contracted players in the 2013 tournament. Meanwhile, Australians Glenn Maxwell and Kane Richardson, without a Test cap between them, were signed for $1m (£642,000) and $700,000 respectively, while little-known South African seamer Chris Morris was picked up for $625,000. England's Professional Cricketers' Association is negotiating with the ECB to allow England players to play a fuller part in the event when their central contracts are renegotiated in October. But the governing body, mindful of its commitments to broadcast partners to put on seven Tests every summer, is unlikely to yield to their demands, sticking to its argument that international cricket must always come first for England players. 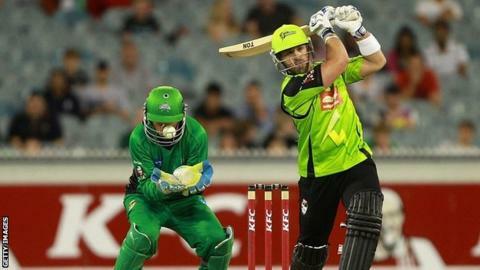 Prior, who played for Sydney Thunder in Australia's Big Bash Twenty20 league in January, is worried that the impasse could cause players to consider retiring early from Test cricket to earn money in the IPL. "If you ask any Englishman or Australian, 'would you rather score a T20 hundred or an Ashes hundred?' I know which one most people would go with, but guys are going to start looking at it," said Prior. "I know for a fact that players want to play in the IPL. You can't get away from the fact that there is an enormous amount of money at stake."